The term symbiosis is used to describe any permanent or long-lasting association between two or more different species of organisms. In the cases presented below, the term host generally refers to the larger member of the partnership, while the smaller member is known as the symbiont, or symbiote. The host typically provides nourishment and shelter for its symbiont, while benefits to the host vary considerably in each type partnership. These relationships may be classified by the type of association, degree of intimacy, and level of dependence. Mutualism - partners mutually benefit (+ +). Commensalism - one partner derives some benefit while the other is unaffected (+ 0). Parasitism - one partner benefits at the expense of the host (+ -). Ectosymbiont (or Episymbiont) - a symbiont that lives attached to the surface of its host cell (including inner surfaces and chambers, such as the gut cavity or ducts of endocrine glands). Endosymbiont - a symbiont that lives within its host, also known as an intracellular symbiont. Facultative symbiont - independent, able to exist in a free-living condition. Obligate symbiont - dependent, so highly adaptive that they have lost the ability to exist independently. Symbiotic interactions involving microorganisms are essential to the ecology of the marine environment. The collections below illustrate the diversity, depth, and specificity of such relationships. Pompeii Worm: The Pompeii worm is a deep-sea polychaete that resides in tubes near hydrothermal vents. It is able to survive extreme temperatures by forming a symbiotic relationship with the protective "fleece-like" bacteria on its back. Squid - Vibrio: The Hawaiian bobtail squid, Euprymna scolopes, houses a colony of luminous Vibrio fischeri in its specialized light organ to serve as anti-predatory defense. 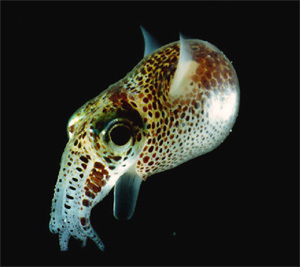 The light produced by the symbiotic bacteria is emitted downward, and the squid can manipulate the intensity of the light to match the intensity of down-welling moon and starlight, thus masking its silhouette to evade bottom-dwelling predators. For additional resources about Marine Sybmiosis, search the Microbial Life collection.